Trail Care PLans for next year - The park would like us to take on more care of the trails, how can we we do it? What can we do to help the Park and enhance the experience for Park visitors? Minutes of the September and Ocotber meetings were accepted. Joining the NY-NJ Trail Conference was approved. Jane thanked Charlie for his donation to purchase hats. The sale has provided income for the Friends. Recreational Trails Grant Program - Jane Daniels has submitted a request for extending the grant. Manager's Minute: Bob Guarino reported that there lighting in parking lot one needs fixing. temporary lighting has been brought in. The truck that the sander fits on died and the sander was moved to the dump truck. So with the park down one truck and the ground not frozen, Frank has not been able to distribute the gravel. He saw that there are posts that look as if there will be a cross walk at Strang Boulevard. Jane will verify with DOT. Trail Care PLans for next year - The park would like us to take on more care of the trails, how can we we do it? John and Charlie said they would like to help. Bill asked if he could have some help on the paths connecting the disc golf holes. Jane said she would go out with him. Mark Kotkin will check out about ordering wildflower seeds and check to make sure they are native to NY. Jesse Jaycox at the regional office will need to verify that the seed mix we used is ok. I Love My Park Day is May 4th. Jane will not be in the area that day. 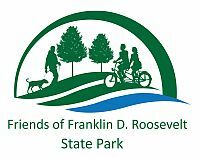 Given that the Friends are going to be taking care of the trails, she can arrange to have a trail maintenance workshop be given at FDR that day. Bob said he would reserve the room for us to use. Bill Newman was interested in attending and would like to include at least one other disc golfer. Charlie asked if there could be a wind barrier installed in Pavilion 1. Bob will check on what can and cannot be installed on the historic structure.